Due to a number of requests and inquiries from OAKWOOD UNIVERSITY alumni for the University to make a statement to current and prospective donors regarding the issue below, the leadership of the University Board of Trustees feels compelled to clarify the facts for our publics. 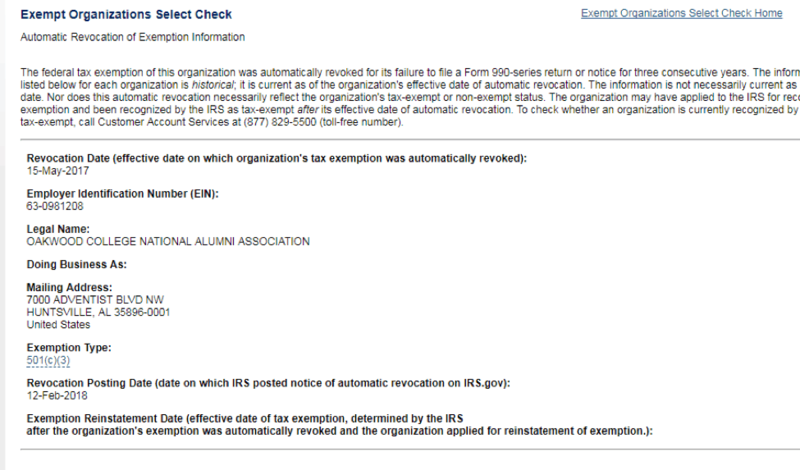 On May 15, 2017 the Internal Revenue Service revoked the 501(c)(3) tax exempt status of the Oakwood College National Alumni Association d/b/a Oakwood University Alumni Association (OUAA) . This fact was brought to the attention of the University through a third party on Feb 23, 2018. OUAA’s stated purpose is to raise funds to support OAKWOOD UNIVERSITY’s mission. This makes the Association an “institution-related organization” under the governing accreditation standards. The SACSCOC Accreditation Standards seek to ensure the institution’s academic and financial integrity. To achieve this goal, the 2018 Accreditation Standards require that the institution control fundraising activities conducted by “Institution-related organizations”. (Section 5.3 of the 2018 Accreditation Standards). As an accredited institution of higher learning, OAKWOOD UNIVERSITY complies with the accreditation standards issued by the SACSCOC (i.e., Southern Association of Colleges and Schools – Commission on Colleges), including standards regulating fundraising by groups declaring themselves organized for the purpose of supporting the University. Compliance with these regional accreditation standards is of vital importance to OAKWOOD UNIVERSITY. In the event of a failure to retain accreditation, OAKWOOD UNIVERSITY’s continuation as an accredited institution of higher learning is jeopardized–access to federal funding is denied and access to HBCU/UNCF funding would be forfeited. On February 23, 2018, the Board of Trustees learned that OUAA’s 501(c)(3) tax exempt status had been revoked, a fact that was confirmed on the IRS website. (See attached information from the IRS site). The Board’s understanding is that the OUAA is actively seeking reinstatement of its exempt status. However, the revocation remains in place at the current time. The loss of OUAA’s non-profit tax-exempt status has a significant effect on its fundraising activities. 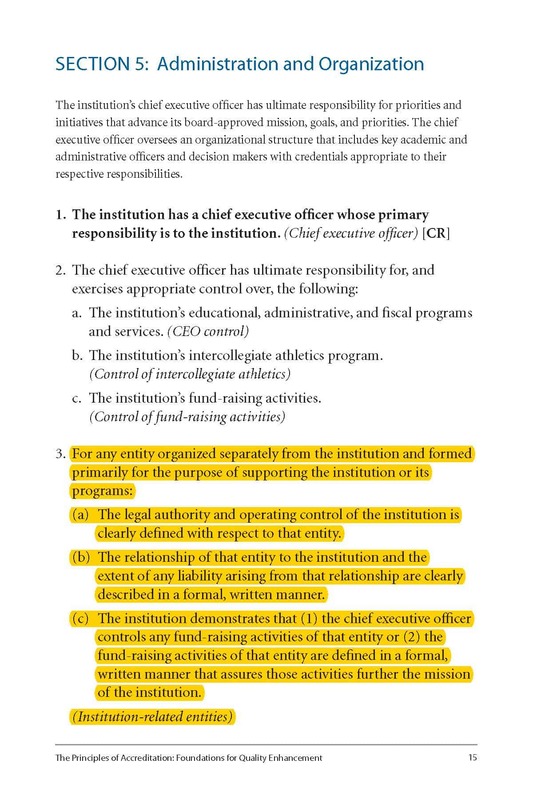 Because OUAA is an institution-related organization under the SACSCOC Accreditation Standards 5.3, OAKWOOD UNIVERSITY has an obligation to control the OUAA’s fundraising in the name of OAKWOOD UNIVERSITY. The Board met several times over recent weeks about these matters. It requested information and action from the OUAA concerning its tax-exempt status and financial operations. With the issues unresolved and Alumni Weekend approaching rapidly, the Board decided to seek an interim understanding between OAKWOOD UNIVERSITY and the OUAA to handle issues through Alumni Weekend and then make any final decisions concerning the future of the parties’ relationship after Alumni Weekend. The efforts by the Board and Administration to come to an interim understanding have failed. After OUAA engaged an attorney to represent its interests, the Board asked OAKWOOD UNIVERSITY’s attorney to confer with him in an attempt to resolve issues relating to fundraising during Alumni Weekend. These efforts were not successful, either. With regard to fundraising by the OUAA during Alumni Weekend, the University’s request was reasonable and straight-forward: It asked that any funds raised or received by the OUAA before and during Alumni Weekend be given/made payable to OAKWOOD UNIVERSITY. The University agreed that it would disburse any such funds to programs or purposes as reasonably requested by the OUAA. With this simple arrangement, OAKWOOD UNIVERSITY’s interim concerns about the propriety of the fundraising efforts by a party whose tax-exempt status has been revoked would be addressed. However, OUAA rejected this proposal, insisting instead on using a third-party organization to receive and hold the funds until its status is reinstated. OAKWOOD UNIVERSITY could not agree to this arrangement in light of its obligations under the Accreditation Standards and its duty to donors. OUAA’s decisions to ignore the Board of Trustees’ counsel has placed the University in a difficult position. OUAA through its website continues to solicit funds without regard to the institution’s wishes/instructions and during a time in which their tax-exempt status has been revoked. The University had hoped to avoid commenting on this situation until after Alumni Weekend, but has decided that the current circumstances warrant this statement and other appropriate actions. In addition, OAKWOOD UNIVERSITY informed the OUAA that the Board will meet to further discuss the current situation. Members of the Board with conflicts of interest will be recused from these deliberations. In the meantime, OAKWOOD UNIVERSITY encourages its Alumni and any other potential donors to the OUAA to consider all information before making any donation to the OUAA. If any donor has a question about the tax deductibility of any donation to the OUAA, he/she should consult with a tax professional. To all of our Oakwood Alumni, please be assured that the University’s tax-exempt status is unaffected by the current situation. OAKWOOD UNIVERSITY appreciates your years of support. If you wish to make a tax-deductible donation directly to OAKWOOD UNIVERSITY, please visit the website at OUgiving.com. Your years of love and support for OAKWOOD UNIVERSITY are deeply appreciated. *We have attached Section 5 of the SACSCOC Standards for anyone interested in reading them.